When I first saw this challenge I thought " now that really IS a challenge!" How do you put a bead on a card, besides using glue? Now I realize I COULD use glue, but I didn't want to. I spotted some stamps I recently purchased from Michaels, a Seven Gypsies collection that contained several different numbers sets and knew I wanted to work with them. After stamping the cute numbers I played off the numbers idea by attaching wires to the card, 9 of them. I bent the wire to create a hook of sorts on both ends that looped around the card. I strung seed beads on each wire, 1, then 2, then 3, etc etc, then I taped the ends on the back side. I mounted the bead card onto playful polka dot paper, went to the computer and typed out the sentiment and then cut and pasted it...Voila! 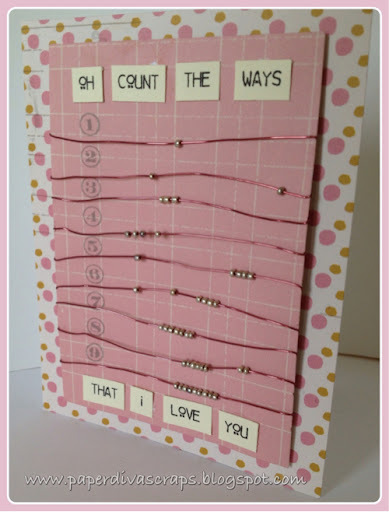 Very creative card, fun with the beads. Thanks for joining us this week at WAW. I love how you used the beads to create a abacus. Great card! Cool idea -- very creative! I love to see creativity in crafter's creations, and this is certainly impressive. Thanks so much for sharing with us in this week's challenge. It's a blessing to have you share and play along. Have a blessed week, and please join us again soon. My what a creative use of beads! Very pretty! This is a really creative card Adrienne, not a lot of white space but a super simple design! What a clever idea! I love this and who wouldn't be just delighted to receive it? Aww.....very sweet. Sounds like you stepped out of your comfort zone and created a card to be proud of, which happens to be perfect for our Opus Gluei challenge! Thank you so much for trying something new, making it your own, and sharing it with us! Well done! Thank you for entering our retro/vintage theme over on the LEJ Challenge Blog. What a fun and playful card. Love the use of beads as it really makes it very unique.. I hope you will play along with us again. Great card! Thanks so much for playing along with The Pink Elephant! This is so creative. Loving the abacus style. Fabulous job, for sure! Thanks for blessing us with your artwork this week at Word Art Wednesday. Hugs, always! http://jatterburycreations.blogspot.comThanks for blessing us with your artwork this week at Word Art Wednesday. Hugs, always! This is delightful!! So very creative, I would never have thought of doing something like this. what a lucky person it is who will receive this special card! Thank you for sharing your art with us at Opus Gluei, I'm so glad we got to see you try something new! Thanks for joining us at Whimsical Designs this week! !